Thanks, everyone, for all of your kind comments about yesterday's mishap. Did I tell you that I'd also been up since 3 with little boy? And that we (little boy and I, during a non-vomiting spell) took both dogs to the vet to get their boarding vaccinations? Haha! Happily, the day got better and not worse. We're still fevery today, but not vomity. This is an improvement. This is last night's local meal. 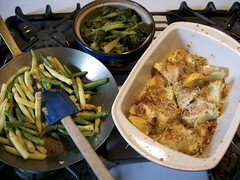 I bought a mixed box of yellow and green beans last week at the farmers market and sauteed them in garlic (mine! ), olive oil, and crushed brown mustard seeds. The broccoli was from last week's (or the week before) farmers market. The star of the show, however, is the "rock and roll squash." I have two favorite farmers at the market. Jill and Keith Forrester, and Lori Greene of Downing Hollow Farm. Lori is a former Memphis Rock'n'Roller who went by the name of Lorette Velvette (warning, this link plays music. Adjust your volume!). I've loved her music for years (I have a thing for tough-girl chic rockers, but very few make the cut). When Lori first started go give me some merchandising advice at the market a year or two ago, I was enchanted by her personality first, and her produce second. There was a writeup about her in Edible Memphis Magazine last year, and I was shocked to make the connection between her music that I loved and her fabulous organic produce. Gary is somewhat older than I am, and he likes to tell stories about how she played with her band in his apartment way back when. One of her bandmates, now a Montessori art teacher, is my across-the-street neighbor. Okay. Back to the food. I cut the rock'n'roll yellow and white pattypan squash into chunks, tossed it with my garlic, olive oil, kosher salt, fresh herbs, and breadcrumbs I made out of the heels of leftover farmers maket and my own baking bread. Roasted at 400 degrees for 30+ minutes. It was SO good. I may not repeat this because the boys weren't thrilled, but I will happily eat the half-pan that's left over.